This Silver Plated Football Money Box makes a wonderful boys christening gift. Shaped like a small football, this delightful money box can be used to save your pennies in, or simply kept as a cool keepsake. This silver plated soccer bank will score a hit with both young and seasoned footie fans, regardless of what team they support!Buying gifts for babies or super soccer stars in the making can sometimes leave you sitting on the sidelines with frustration! Do you go for a 2-2-1 formation and get booties, mittens and a bib? Or shoot on goal with a striking silver gift? 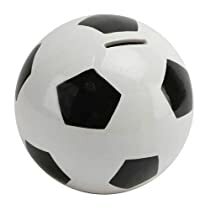 Well, don’t get caught offside with the pitch of usual presents, kick all those woes away and hit the back of the net with this chic and incredibly shiny football money box. It can be filled with both pennies and pounds through the slot on top and when you, or your teammate needs a sub you can call on your reserve cash via the disc-like stopper in the base.Ok, enough with the football puns! Basically what we are trying to say is that this terrific football piggy bank makes the perfect christening gift, gifts for godchildren, birthday and Christmas presents too!